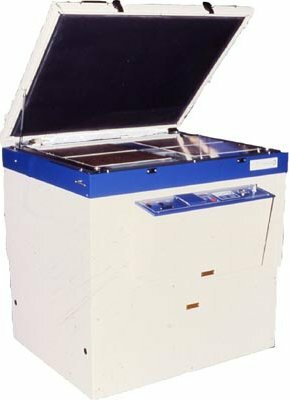 This unit has been developed from the very successful and well proven T162 Rotex plate printing down unit used in the graphic arts over many year's. It consists of a robust metal cabinet that splits into two for ease of installation where access is limited. The lower section contains the light source, power pack and suction pump, whilst the upper cabinet has the control box fitted onto the front face with the glass and blanket frame mounted on the top. There are 3 versions available, for each of the 2 sizes of machine. The basic unit is fitted with a timer with which to control the exposure, and no shutter, so the lamp will strike to carry out the exposure, and then shut off, this unit is adequate where a small number of screens per day are required, less than 30. For more accurate control of the exposures, an integrator model is available, but still using the same lamp unit, with no shutter, so for lower production enviroments, but with more accurate control of exposure.